Last year, Helen and Hannah introduced the idea of a ‘covert curriculum’ to a group of pre-service teachers at the Ontario Institute for Studies in Education, in order to shape a discussion about the expectations, values, and behaviours that are unofficially learned in educational contexts. This led them to Netherlands-based artist, Annette Krauss, who is well known for her ongoing project, ‘The Hidden Curriculum’ produced with support from Casco (Utrecht 2007), Walden #3 (Munich 2010), Kunsthaus (Dresden 2010), The Showroom (London 2012), and Whitechapel Gallery (London 2012-2013). The idea of a hidden curriculum refers to the expectations, values, and behaviours that are learned in educational contexts, without being necessarily recognized, intended or desired. Krauss’s other projects such as ‘Read-In,’ (with Hilde Tuinstra, Laura Pardo, Maiko Tanaka, 2010-present) and ‘The Site for Unlearning’ (Tbilisi Triennial 2012) also explore approaches to art making as forms of research and pedagogy. In these works, the role of the document is interrogated, manipulated or outright evaded. As with many participatory research projects, Krauss’s works perform necessary acts of translation, responding to the urgent questions, doubts and projections about how a project is to circulate among audiences beyond the immediate participants. In her most recent book, Artificial Hells, Claire Bishop contends that the question of how to communicate art-as-pedagogy to an external audience is a pressing and ongoing dilemma. In shaping her arguments, she notes that classrooms have no image; they have no spectators, meaning the art world is typically not present during the participatory project, and thus their ‘access’ to the process and the messiness is excluded. Bishop writes, “Education is a closed process of social exchange, undertaken with mutual commitment, over a long duration, rather [than] the performance of acts to be observed by others.” Bishop surmises that what is at stake is a double ontology, whereby participatory art projects exist or function for two audiences. The primary audience is the students and teachers who work with an artist, while the secondary audience is the art world consisting of artists, scholars, curators, and critics and even a general public, all of whom are external to the event itself. In many instances, artists attempt to translate the project for a secondary audience through inventive approaches to their documentation. Often, these necessary ‘document solutions’ serve not only to transmit the work, but also contribute to formal innovation within the disciplinary fields in which they are located (sculpture, photography, performance, event-based, socially engaged and pedagogical practices). We see this in Allora and Calzadilla’s use of the trace, Richard Long’s line walked in a field, Barbara Steveni’s appropriation of the archive, Marina Abramovic’s re-staging of influential performance works, Valie Export’s fictionalized photos of a public intervention, Allan Kaprow’s curriculum-based-event-plan-ephemera and many more. With respect to art-as-pedagogy, the issue of post-production continues to require inventiveness and careful selection alongside ethical and disciplinary expectations. Hannah and Helen met with Annette Krauss to talk about the Hidden Curriculum project and issues related to collaboration, authorship, innovation, documentation and post-production in her work. Helen Reed: To begin, Annette can you describe the Hidden Curriculum project? Annette Krauss: The Hidden Curriculum is an art project that focuses on the unidentified, unintended and unrecognized forms of knowledge, values and beliefs in the context of secondary school education. It could be explained as an investigation of everything that is learned alongside the official curriculum. On one hand these other forms of knowledge include various kinds of actions and tactics challenging enforced cultural values and attitudes (e.g. punctuality, tidiness, etc.). On the other hand the project looks at practices that students develop in order to cope with the requirements in everyday life in school, investigating forms of subordination, hierarchies and silent violence. In very general terms the project deals with the realm of communication, trying to address its blind spots, hidden niches and mute practices that are contained within everyday routines at school. The format of the Hidden Curriculum project is workshop-based. The idea has been to further develop a framework, together with students, that allows us to approach what a ‘hidden curriculum’ means and does. It’s a ‘thinking by doing’ process that tries to situate the hidden curriculum in the specific circumstances of the participants, in their schools, and within the conditions of each project at a certain time and place. The project has been realized with students ranging from 13 to 17 years old and has taken place seven times, in different countries such as Germany, the Netherlands, the United Kingdom and France. Generally the project takes place during school time, running parallel to other subjects, for several hours a week. The duration, and the hours the school and pupils commit to the project vary and depend on long negotiations that happen beforehand with the school. The individual workshops set a framework for the pupils to investigate their surroundings, and their own actions and behaviours within them. By observing themselves and their colleagues critically, they start to address how they deal with the rules and conventions of everyday life – how these are internalized and perhaps unconsciously resisted. Through this, the students actively reflect on the legitimacy of specific social contexts. 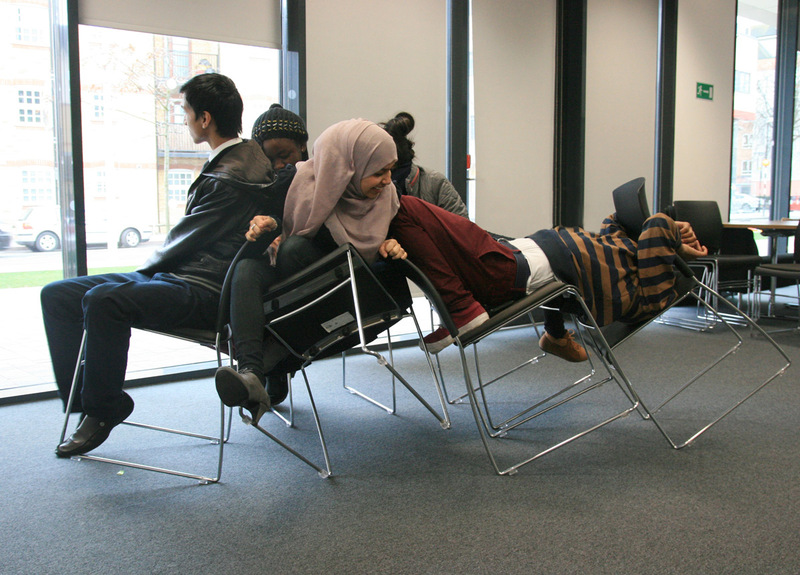 In small groups, they begin to develop performative situations, or interventions, that respond to these questions, as well as comment on the conventions and unwritten rules in their direct environment. 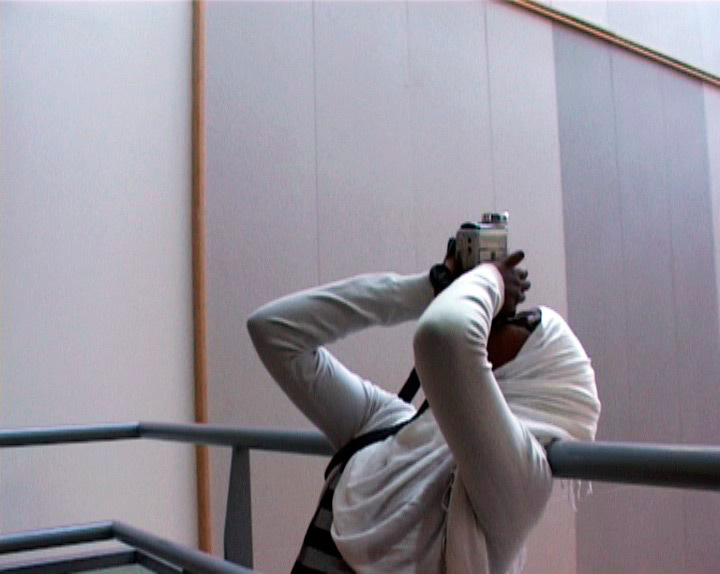 This ‘thinking by doing’ process has prompted the documentation of these performances with film, audio and photography by the students themselves. As a result, the students get a basic introduction to video cameras and sound equipment – we always discuss what it means to document. HR: We first came across the Hidden Curriculum Files when we were helping Art Metropole move. It is an artist-run centre that distributes artist multiples and printed matter in Toronto. While “helping” we ended up skimming through each and every book before placing it in a box. And that’s how we found the Hidden Curriculum Files. We had heard about the project already, but hadn’t seen the actual documents. Hannah Jickling: It was great timing to find this aspect of your work, because we have been fretting about how to represent our own projects, especially the art-works we created with groups of students this year, for an audience beyond the schools. The Hidden Curriculum Files gave us hope for how a participatory project might function outside of its initial context. The complexities and layers of participation and collaboration are made visible and at the same time the files are aesthetically successful and inviting as works in their own right. Along with questions we have for you about producing the Hidden Curriculum project, we are wondering about the process of creating the Hidden Curriculum Files: the decisions you made about how to represent your work with the students and how these documents give form and credibility to your art practice. The files were conceived of as a project within the project. The Hidden Curriculum Files were done in collaboration with art students at the Gerrit Rietveld Academie. Together with Julia Born, a graphic-designer and tutor at the academy, we tried to challenge the students’ understandings and approaches towards a hidden curriculum. Do you also know the other publication with the excuses on the cover? This publication I see more as a discursive framing of the project. In the book there’s a text from a sociologist that I have been working with, an interview between Marina Vishmidt, Emily Pethick and myself, artwork by Ashley Hunt, and reflections by Celine Condorelli and Fiona Parry. The book brings together the things that I was struggling with theoretically at that point – in relation to the Hidden Curriculum. There’s also a DVD with all the compilation material produced by the pupils for the pupils. Something we’ve kept doing since then. So overall, in addition to the in-school project, there are three publications that are part of the first Hidden Curriculum project that happened in Utrecht. HR: Can you tell us more about why it was important to explore the theoretical struggles associated with the Hidden Curriculum project? Can you reflect on what is meant by ‘theoretical’ and why this was helpful? Also, what was it about the format of a book that allowed you this kind of exploration? This question is funny, since I was recently in conversation with someone who posed the question the other way around. They wanted to know why the discursive elaboration wasn’t enough. For me, the entanglement of the material produced by students, as well as the discursive side of learning in school, makes it inevitable for the project to have to approach and theorize both. We shouldn’t forget that the decision for a ‘thinking by doing’ and ‘doing by thinking’ approach is motivated by my desire for how to approach what we are doing along the way. Furthermore, it is a way for the hidden curriculum research to tackle the physicality of education, namely the students’ bodies in interaction with their material and discursive environments, practically and theoretically. It is a way to bring theory and practice into conversation with each other. The publications from 2008 are one step in the research as they record the interviews, texts, actions and workshops. But again, what seems most important for me is to bring bodies, (and here I refer to human and nonhuman, objects) and meanings together in approaching any form of learning. HR: I am curious about what we see in the files versus what has been left out. Could you talk a bit more about what we are we not seeing and for what reasons? I would say that what’s shown in the Hidden Curriculum Files is about one-tenth of the project. But I guess that counts for the whole project. This actually points to broader discussions around visibility and invisibility that have arisen throughout the years. A huge part of the Hidden Curriculum project is about the students’ secret actions and subversive tricks in school. So, in honouring their right and desires to disclose or withhold these actions, interesting opportunities appeared to discuss what could or couldn’t be shown. Going back to the issue of the students’ secrets, we felt the urge to create an agreement and framework for discussing these secrets in public without necessarily revealing them. The pupils suggested the so-called Hidden Curriculum Archive. It is a way to collect the secret actions and practices that they use in order to face the requirements and institutional structures of school. This archive has two sections: one is public, parts of which became the Hidden Curriculum Files, and one is strictly confidential – students would always discuss which section of the archive these secrets would enter. In this way both parts are always under discussion. But also the logistics of the archive, the travelling of one workshop series to another brings challenging questions: for example, in order to bring the project to other groups of students, we agreed that I would only do this if there was not another teacher present. My part in this was, and always is, very difficult and it’s never really resolved, it’s a paradox. HJ: Could you talk a bit more about how you understand the critical importance of the students’ secrets? Students’ secrets are very often associated with deviant behaviour in school. Needless to say, the Hidden Curriculum project is not about changing deviant behaviour, but more about investigating the potential for change that comes from it. There is a lot we can learn and should take seriously when doing things that might not be allowed in the first place. It has been interesting to think about whether this deviant behaviour is actually reaffirming the system of the school and how far the two might be entangled. The title of the project itself, the Hidden Curriculum, has been misleading in workshops, in that it’s introducing something that is hidden and provokes a ‘need’ to reveal the invisible. This obviously needs further scrutiny. The workshop tries to establish a closer look at the function of (in)visibilities in society, and the different ways we might relate to them and utilize them for our own agendas. In this sense, the secrets in school are departure points for many investigations – looking at them as a form of deviant behaviour is one way to see them, elaborating on them with regards to their function is another. And yet a further aspect of the secrets that was brought up in the workshops was about acknowledging that (in)visibilities and (in)visible spaces and are simply part of our life. In this, there is opportunity to attend to the continuous presence, production and revelation of blind spots. And there is an initial impulse to just want to reveal these blind spots, but there is more there about how a blind spot might function in a society in which, for example, the dominant paradigm is one of visibility and transparency. It becomes a matter of accepting that whatever we do or say in this very moment will mean more than, and be different from, what we intend. How can we relate to this, theoretically but also very practically, in actions and movements? One of the biggest aspects of the Hidden Curriculum project is how it gets negotiated within a school context. At a certain point within the process, I’ll be discussing what the project could mean with teachers and administration, and inevitably, one of the teachers will always want to see the secret material. I wonder, “How can you even ask such a question? It is so unethical. No! You will not get it. You get the public material like anyone else, and that’s it.” The challenge is to understand the project beyond the revelation of students’ secrets. The project is more about the critical awareness and intervention that students take from within institutions, it is meant to highlight their agency in this, it is meant to allow them a way to speak back to the processes of schooling. HJ:< All of these levels of representation are interesting. There are the clandestine structures, games and secret archives in which aspects of the project circulate – some of which you, as the facilitator, don’t even have access to. Then there is what has been exhibited in art spaces, what you talk about with people, and in lectures, and also speculation about what may have circulated on-line. The Hidden Curriculum book, the Hidden Curriculum Files and the DVDs are more curated and finite forms. I wanted to know about the book in particular – what audience did you have in mind for it? An art audience. However, with the Hidden Curriculum Files, we were thinking much more about overlapping art audiences and student audiences. If you asked about the pupils who were involved, what they were most interested in, it was very clearly the DVD. It contains the material they produced, and is structured in a way that they could easily access. Every one of them got each of the three documents, but with the more theoretical booklet, which I love, some of them said, “keep it because we don’t need it, we will not read it anyway,” which I do understand. HR: This is all so helpful as we reflect on the projects we produced with students. As we created the work with them I think we were constrained by the idea of what a final outcome needed to be, which I think is unfortunate, but also realistic. We were feeling the pressing need to have the work circulate beyond the classroom in some way, to do another kind of justice to this process we’d committed to. I also struggle with imagining the final product of a collaboratively generated project in which students may or may not be acquainted with putting their ideas into a form, whatever that form might be. So I wonder, to what degree do I feel manipulative? At what point do I say, “Stop, you’ve produced so many ideas now, I think you can be confident.” Over the years, I’ve noticed that the moment I say stop, is the moment that gets the most emphasis. And then I think, what does it mean to do this? I really start to question myself. HJ: I know what you mean, but I think that’s okay. Especially within the kinds of projects we create, there are tricky expectations that can start to dictate what collaboration should look like. It becomes embarrassing to admit that you want to have certain kinds of control, or that you’re manipulating. Absolutely. But I think it’s a normal way of interacting with each other. When I work with groups of students, I don’t make myself invisible, I am there with the whole package that I bring in from the previous versions of the Hidden Curriculum projects. Of course this influences the students and I am always wondering about when to show parts of the previous projects. When does this make sense? When is it okay to introduce this material in order to get somewhere, and does ‘somewhere’ actually mean ‘my somewhere.’ Like you said, we also have to de-mystify this whole process of social practice and collaborative practice. My strategy is to be open about my visibility in the classroom, to try to acknowledge my presence and direction within the process. At the same time, when I identify myself this way, I am not always sure if the students understand. I like to be with different people and like to have different conversations on many levels; so to whom am I actually speaking? It changes. Sometimes it looks like I am talking to the students, but I’m actually speaking to my assistant who is also an artist. Or sometimes I am speaking to my assistant, but actually subtly trying to talk to the teacher. So my presence, the understanding of what this means, and how it is communicated is unresolved. Sometimes I have the need for resolution, but sometimes I like it to be unresolved. I am surrounded by paradoxes and I have a feeling that we are caught up in a system that constantly wants to resolve these paradoxes, instead of trying to find ways to build upon them. This is our practice, this is our life and I think we have to learn to engage without necessarily resolving them. Maybe it brings us somewhere else. HJ: I know, there’s pressure for things to be tight and rigorous in a very particular way, divergences or messes are not allowed. It’s kind of funny to talk about it now, but then to feel it and be ‘in it’ is so uncomfortable. It’s hard to not internalize and instrumentalize these pressures in our projects and I agree with you, the need for resolution places limits on the results. Where and what could that ‘somewhere else’ be? For me, there is really something in feminist theory, because so much of this messiness is brought in to the discourse. It gives me a lot and feeds me, so I can go on working within these paradoxes without necessarily wanting to solve them. HR: Can you give us some examples of feminist work and discourse that has been important for you? bell hooks’s Teaching to Transgress and Talking Back, Carmen Mörsch’s Alliances for Unlearning, Donna Haraway’s Situated Knowledges and Modest Witness, Gayatri Spivak’s Postcolonial Critic, Outside in the Teaching Machine and Aesthetic Education in the Era of Globalization, Irit Rogoff’s writings, Nora Sternfeld’s Das pädagogische Unverhältnis and Sara Ahmed’s Queer Phenomenology and Cultural Politics of Emotions…I could go on with many more. I also draw on the work of artists such as Adrian Piper, Group Material, the Guerrila Girls, Hito Steyerl, Janna Graham (Ultra-Red), Joyce Wieland, Lygia Clark, Martha Rosler and Natascha Sadr Haghighian. HJ: In terms of drawing on artists’ works, I wanted to go back to something I noticed in the Hidden Curriculum Files. One of the ten zine-like booklets consists of photographs from one of your workshops with students. Students are balancing chairs on their heads, hiding in cupboards and climbing into the school’s ceiling. These images are paired with references to ‘chair pieces’ such as Bruce Nauman’s Failing to Levitate in the Studio (1966), Doris Salcedo’s installation at the Istanbul Biennial (2003), and Bram Stoker’s Chair VI (2005) by Sam Taylor-Wood. Can you talk about the importance of using contemporary art works to illustrate ideas to school children? Can we think about the classroom as a contemporary exhibition space and why might this be important? The references could be seen as a possibility to discuss with students how ideas don’t fall from the sky and that they are embedded in the legacies of artistic practices that I am invested in. But at the same time, experimenting with the ‘chair pieces’ is an act of questioning authorship and the ways that some artists’ work is approached as a ‘status object’ in the art world. Friends and colleagues would point them out to me as a way to say, “What you are doing is not new.” For me this was not about being new, it was about opening a mode of investigation. Moreover what has already been done in the art world is not necessarily a concern for the students either, so to take up these pieces as explorations in the school became a really valuable experience, a way for the students to find these spaces themselves. So this is what I’m interested in, these strange synergies that come from authorship but can actually allow for what might be considered a kind of collaborative practice. My motivation to contextualize these investigations has really come out of this impulse to go against the genius act. HJ: By selecting these works for reference, how might this be seen as a kind of curatorial practice? Of course I want to contextualize. I really like this idea of curating, because you are not alone in this world. These ideas are always situated in a certain discourse and can be actively used in many different discussions. HR: For you, do these ideas about contextualizing come back around to the importance of post-production and documentation? 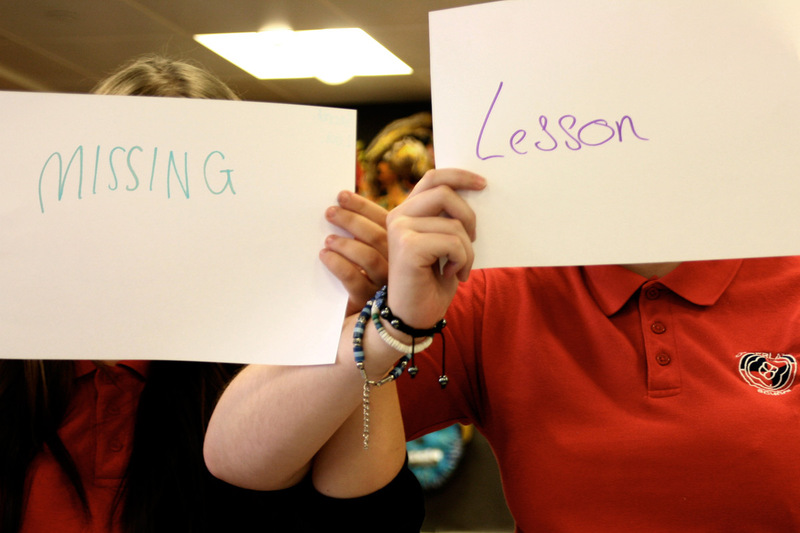 Did you have an outcome in mind as you were doing the projects and workshops with the students? Of course I had – isn’t it more a question of to what extent? I didn’t enter the first project as a blank page on which the students would inscribe their actions and reflections. And I do not believe that anyone could. Nevertheless, I was surprised by the format that was generated. After the first two series of workshops in Utrecht and Berlin, it was much more clear how the forthcoming workshops would work in terms of video and photo outcomes, but also in terms of suggestions for generated processes from the position of the students. Showing the material that was produced in previous workshops to new groups of students was very suggestive and certainly not without problems. That doesn’t mean that there weren’t surprising twists. For example in the last workshop in London, the students focus much more on performative situations that would then be enacted several times, instead of documenting and showing the video sequences. This certainly brings new challenges to the investigations. ANETTE KRAUSS (based in Utrecht/NL) is an artist whose conceptual-based practice addresses the intersection of art, politics and everyday life. Her research revolves around informal knowledge and institutionalized normalization processes. Krauss’ work emerges through the intersection of different tools including performance, film, historical research, pedagogy and written material. With these tools, she explores the possibilities of participatory practices and performativity, investigating institutional structures in order to work and think through the question – how do we know what we know? Recent exhibitions/projects/presentations include ‘Hidden Curriculum/In Search of the Missing Lessons,’ Whitechapel Gallery 2013; ‘(In)visibilities,’ The Showroom London 2012; ‘GDR goes on – Grand Domestic Revolution,’ Casco 2012; ‘Amateurism,’ Kunstverein Heidelberg 2012; ‘For Einhoven’ Van Abbemuseum Einhoven/NL 2011; ‘We are Grammar’ Pratt Gallery/New York 2011; ‘School Days’, Lewis Glucksman Gallery/Cork 2011. HANNAH JICKLING experiments with the possibilities of form, participation and meaning-making across disciplines and publics. Her projects often take shape as site-specific sculptures, public installations, events, exchanges, photographs, multiples, printed matter and other ephemera. Atypical forms of distribution, entrepreneurial scheming and audience-seeking are important strategies for supporting and disseminating her work. Hannah has recently completed artist residencies at Outdoor School (Multnomah Education Service District), The Pedagogical Impulse (University of Toronto), Becoming Pedagogical (University of British Columbia) and the Raumars Artist-in-Residence Programme (Rauma, Finland). Her work is held in private collections across North America and can be tasted in the form of sourdough pancakes, an ongoing work hosted at Bubby’s in Manhattan. She holds a BFA from the Nova Scotia College of Art and Design and an MFA from Portland State University. She frequently collaborates with Helen Reed. HELEN REED works with specific groups of people such as Twin Peaks fans, lesbian separatists, and high school art teacher candidates. In each project, collaboration is a working process from which the artwork emerges. Reed favors collaborators that reflect her interest in participatory culture, affinity groups, and fantasy-based subcultures. Her projects take vernacular form such as television shows, publications, postcards and other forms of easily transmittable and dispersed media, so as to circulate back into the communities from which they are generated. Reed has exhibited work at Prefix Institute for Contemporary Art (Toronto), apexart (New York), Smack Mellon (New York), Portland Art Museum, Seattle Art Museum and La Centrale Galerie Powerhouse (Montréal). She holds a BFA from the Emily Carr University of Art and Design (Vancouver), an MFA in Art and Social Practice from Portland State University. Bishop, Claire. (2012). Artificial Hells (pp. 260). London: Verso. Ask Me Chocolates, Your Lupines or Your Life, Upside-down and Backwards and Extra Curricular Curriculum Vitae were artworks created by Hannah Jickling and Helen Reed in collaboration with K-12 students and teacher candidates in Toronto (2012), with support from the Pedagogical Impulse. Alkemeyer, Thomas. (2007). The Physicality of Education. On the Silent Power of Symbolic Violence. A. Krauss & E. Pethick (Eds. ), Hidden Curriculum (pp. 45 – 46). Utrecht, The Netherlands: Casco Office for Art, Design and Theory. Krauss, A., Pethick, E., & Vishmidt, M. (2007). Spaces of Unexpected Learning. A. Krauss & E. Pethick (Eds. ), Hidden Curriculum (pp. 29 – 34). Utrecht, The Netherlands: Casco Office for Art, Design and Theory. Hunt, Ashley. (2007). Order: After the Jena 6 by Ashley Hunt. A. Krauss & E. Pethick (Eds. ), Hidden Curriculum (pp. 64). Utrecht, The Netherlands: Casco Office for Art, Design and Theory. Condorelli, Celine. (2007). Show and Tell. A. Krauss & E. Pethick (Eds. ), Hidden Curriculum (pp. 21-28). Utrecht, The Netherlands: Casco Office for Art, Design and Theory. Parry, Fiona. (2007). How to investigate a Hidden Curriculum? A. Krauss & E. Pethick (Eds. ), Hidden Curriculum (pp. 15 – 20). Utrecht, The Netherlands: Casco Office for Art, Design and Theory. Download Documenting Secrets as a PDF file.